If you are part of the fan-base that loves the Nokia 808 PureView and its 41MP camera with xenon flash, you have a distinct appreciation for the camera bump on the back of the device. That bump accommodates more than just the photo sensor, it also encloses the capacitors for the xenon flash. Owners of the PureView have no issue with that tradeoff. The rest of us have to deal with lesser cameras and much-lesser LED flashes. Those LED lights make good flash lights and video recording lights, but they are not very good performers as camera flashes. Even people that are not photo enthusiasts can see what happens to colors and surroundings that get over exposed and washed out. A xenon flash is an ideal alternative to the LED (if you must use a flash), but current xenon technology is not nearly as compact as it needs to be in order for it to be usable in today’s ultra-thin smartphones. A xenon flash works through a capacitor releasing a charge into a chamber filled with xenon gas. It is that capacitor that makes the bulb too bulky for smartphone applications (not including the PureView). Fortunately, there is a group of researchers in Singapore that have found a solution to enable such technology to fit a lot easier in thinner smartphones, or any smaller device with a camera really. Professor Lee Pooi See at the Nanyang Technological University (NTU) in Singapore has found a way to create a capacitor made from polymers that are layered together flat, and able to store the needed electric charge. The new unit is about 20% of the size of today’s 5mm thick capacitors. At only 1mm thick, you might think that there would be a trade off in performance. That is not the case according to Jack Tuen, CEO of Xenon Technologies. The company started working with NTU last summer on the prototype. The challenge now is developing a way to mass produce this new polymer capacitor technology. Mr. Tuen is fairly confident (and we can understand why) that manufacturers of smartphones and cameras alike will be very interested in incorporating this technology into their products. Xenon Technologies expects that we will see this new technology in consumer products late next year. For those that do not want to give up their LED as a flashlight or video-recording light, there is little chance that we will see LEDs go away, rather, we will see the arrangement that users of the Nokia 808 PureView have had all this time, a xenon/LED combination module. Looks like Nokia and HTC might be able to add a new dimension in the camera contest in future smartphones. 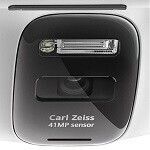 Part of the Nokia 808 PureView's camera bump is accommodating two xenon flash capacitors. The ultra-thin polymer capacitor can provide the same performance as today's capacitors, but only a fifth of the size. Associate Professor Lee Pooi See at Nanyang Technological University, and Jack Tuen, CEO of Xenon Technologies. Nokia should make a new phone with Xenon flash, Camera with Xenon makes better pictures. My old N8 still makes awsome photo's, better than Iphones, Galaxy phones and Xperia phones! Even Samsung, Motorola, Sony old phone also with Xenon flash.. that meant also makes better pciture than other? No Nokia phones makes the best pictures, it's not only hardware but also software! The quality of the Xenon flash, sensor, lens/optics, and image processing algorithms/software matter. Nokia has led the competition in quality components and I am not talking about the build quality but the specifications such as sensor size, type of lens, power of the xenon capacitor and so forth. That is why historically, Nokia's camera flagships have beat similarly featured camera phones in each smartphone generation. Example, the N82 had a technically better camera system than the Motorola ZN5 Kodak phone, the Samsung Memoir and a few Sony Cybershot phones. The N8 beat out Sony's and Motorola's xenon equipped Symbian and Android offerings as well due to the stated facts in the beginning of my post. In short, it takes more than just including a xenon to produce accurate photos. With that being said, I would take a xenon over a LED any day from any manufacture if the same manufacture had a LED flash camera of the same model. The rise of Xenon one more! 1/5 of the size??? lol.. look at the pics presented. If that's truly the new cap, it's more like 1/50 of the size.